Do you enjoy seeing “before and after” photos? I do – especially with landscapes. Just over a year ago, I was asked to help renovate a local church’s landscape. As you can see their landscape had become rather bare as plants had not been replaced over the years. In addition, there were some old plants that needed replacing. So, I got to work on a new design. When renovating an existing landscape, it’s important to determine which existing plants to keep. I rarely get rid of all the plants since mature plants help anchor a new landscape while the new plants take time to fill in and grow. Also, why waste a perfectly good plant as long as it is still attractive and can fit into your design? You can always create a design to go with an existing plant. A year after being installed, I was asked to come back to work on a different area of the church, During that time, I took some “after” pictures of what the landscape looks like now. This area was filled with two old shrubs, which we elected to keep. Some contouring (mounding) was added for elevation and river rock washes were added for drainage. And this is what it looks like 1 year later. Flowering feathery cassia (Senna artemisioides) adds color in winter and spring. Year round color is supplied by angelita daisies (Tetraneuris acaulis) and ‘Blue Bells’ (Eremophila hygrophana). Agave and boulders will add texture contrast. In this area, I tagged two struggling shrubs with paint for removal along with a yucca plant that the church landscape committee wanted removed due to it poking people with its sharp leaves as they walked by. The Mexican bird-of-paradise (Caesalpinia mexicana) tree would remain in this area. The small wash was redone, which serves double duty – it adds a decorative element to the landscape and helps channel water from the roof. Golden barrel cacti (Echinocactus grusonii) were planted in the corner where they will lend sunny yellow color all year long. ‘Blue bell’ shrubs complete the planting in this area. While pink fairy duster (Calliandra eriophylla) is a beautiful desert shrub in spring, it makes a poor hedge. In addition, it does not flower 9 months of the year. A plant that would look great throughout the majority of the year was needed in this area. Ornamental grasses fit the bill perfectly in this area. Pink muhly (Muhlenbergia capillaris) is green from spring through summer and puts on a show in fall when burgundy plumes appear that fade to an attractive wheat color in winter. Instead of a hedge, which would need pruning throughout the year, pink muhly needs pruning once, in spring. This area had a few sage shrubs, a single red yucca and a barrel cactus. I had everything removed in this bed except for the barrel cactus. The church had a large number of old Texas sage shrubs (Leucophyllum frutescens ‘Green Cloud’). The reason that I had many of these taken out was because a the majority of the members of this church are winter visitors. Texas sage flowers in summer and early fall when they are gone. I was asked to add plants that would provide winter and spring color. Now this area is filled with feathery cassia and Valentine bush (Eremophila maculata ‘Valentine), both of which flower in winter and spring. Desert spoon (Dasylirion wheeleri) adds both color and texture contrast and ‘Blue bell’ shrubs will add colorful flowers throughout the entire year. This corner section of the landscape was filled with formally pruned shrubs that offered little beauty to the area. The ocotillo and yucca remained and angelita daisies, ‘Blue Bell’ and feathery cassia were added. I must admit that I was quite pleased at how everything looked. It’s one thing to create a design on paper and another thing entirely to see it growing in beautifully. On a slightly different note, I also took time to check on the streetside landscape by the church that I had designed 2 years ago. In the beginning, there was nothing there but an old cactus or two. What a difference 2 years makes! A young palo blanco tree (Acacia willardiana) grows among feathery cassia, Valentine and purple trailing lantana. The plant palette for the church mirrored that of the street landscape for a visually seamless transition. Along this section fo the street, all that was present were 3 Agave americana and utility boxes. The agave were relocated along this stretch of road with trees and colorful shrubs. You can hardly see the utility boxes now. Thank you for letting me share with you some of my favorite “before and after” photos. Learn more about the plants that I used in this project by clicking their names: ‘Blue Bell’ shrubs, feathery cassia, Valentine bush and pink muhly grass. *Do you have an area in your landscape that needs a little help? Take some time and drive around and take pictures of landscapes that you like. Then take them to your local nursery or landscape professional and have them help you renovate your landscape. Noelle Johnson, aka, 'AZ Plant Lady' is a horticulturist, certified arborist, and landscape consultant who helps people learn how to create, grow, and maintain beautiful desert gardens that thrive in a hot, dry climate. She does this through her consulting services, her online class Desert Gardening 101, and her monthly membership club, Through the Garden Gate. As she likes to tell desert-dwellers, "Gardening in the desert isn't hard, but it is different." Wow, you do beautiful work! I loved seeing these before and after pics. Thanks for sharing. SUBSCRIBE for the latest garden news and get my free pruning guide! 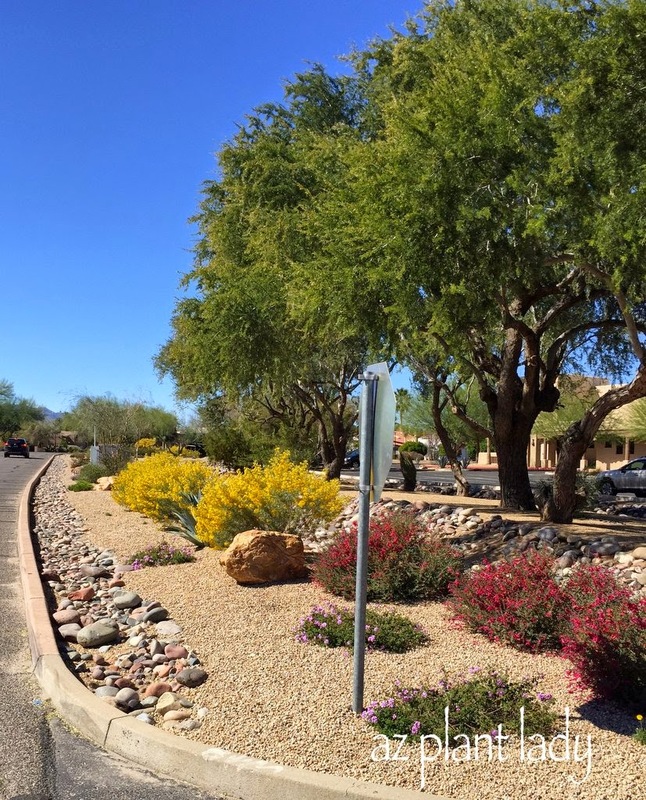 Learn About My Popular Programs for Desert Gardeners!